We at Our Redeemer’s feel called to share this statement by the Bishop of the Evangelical Lutheran Church in Jordan and the Holy Land (ELCJH). Israel’s violent action a few days ago against unarmed protestors at the Gaza border resulted in the deaths of at least 60 human beings and more than 2000 injuries. The Evangelical Lutheran Church of Jordan and the Holy Land statement strongly condemns these killings and the unjustified and disproportionate use of force against unarmed civilians, as they condemn all violence. 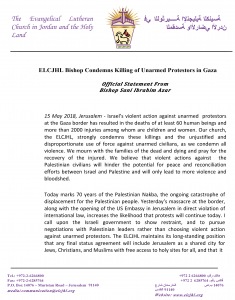 Bishop Azra writes that the the ELCJH believes that violent actions against the Palestinian civilians will hinder the potential for peace and reconciliation efforts between Israel and Palestine. Please read the statement in its entirety, below.